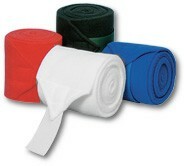 Deluxe Quality Polo Wraps - see description. Set of 4 - Available in white, black, purple, hunter green, royal blue, red, and burgundy. Made by Vac's for over 30 years. This EXTRA THICK heavy weight shock resistant, acrylic stretch pile made especially by Vac's provides better distribution of support, and requires no extra padding beneath. This top quality wrap is used by horsemen all over the world during exercise or shipping to provide support and protection. New EXTRA WIDE x 6 inch long durable hook and loop fasteners sewn on to a folded point with strong poly thread and Vac's exclusive stitching for strong hold and durability.